We have been continuing westward along the south coast of England, visiting iconic towns we've heard of before but never visited. Our pilgrim fathers and mothers were here, and so were those sailing heroes who defeated the Spanish Armada and the more recent hero soldiers we fought with in two World Wars. We see snippets of this history everywhere we visit, along with reminders of more peaceful times, such as Agatha Christie's summer home and the childhood hometown of Arthur Babbage (inventor of the first computer). 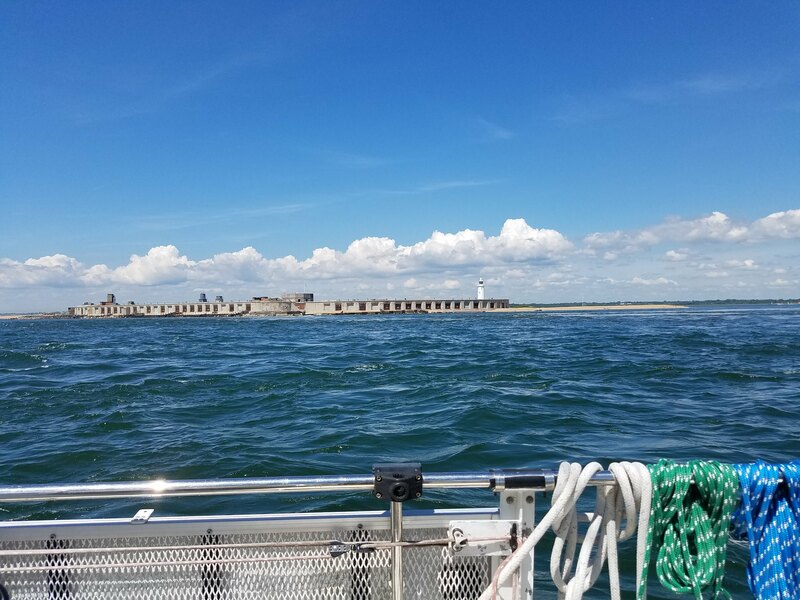 We left Portsmouth on a sunny, windy day, and all the sailors were out, sailing on the Solent, as every good English sailor is supposed to do (although we have met a few who said the Solent was not a favorite place). There were dinghy races and races involving much larger boats. We sailed past Cowes, where the very rich sailors live. 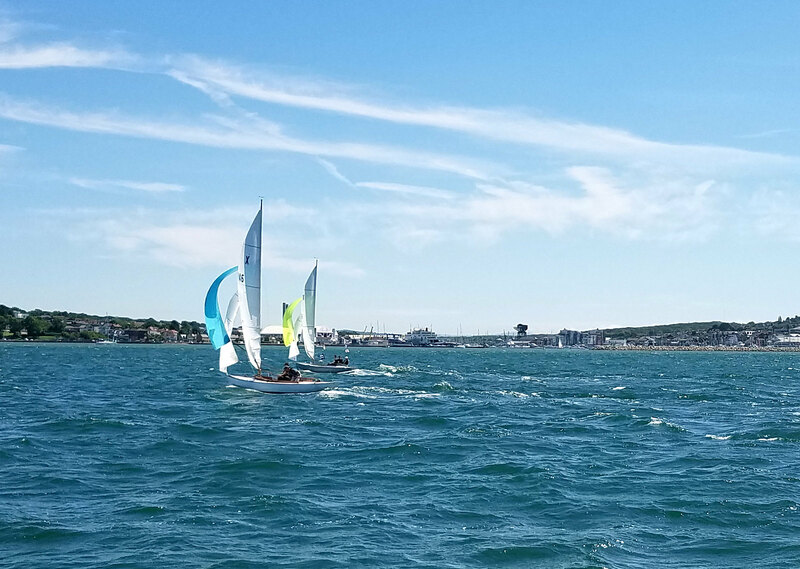 Above: Small dinghy racing with the City of Cowes in the distance. We had hoped to put into Yarmouth on the Isle of Wight, but they were all booked up with an "Old Gaffers Association" event. Silly me, my immediate thought was that an old gaffer was an old man, or maybe something to do with filmmaking, but it turns out it means older gaff-rigged sailboats. So we went instead to Lymington, which is on the south coast, and is indeed a ferry ride away from Yarmouth and the old gaffers. 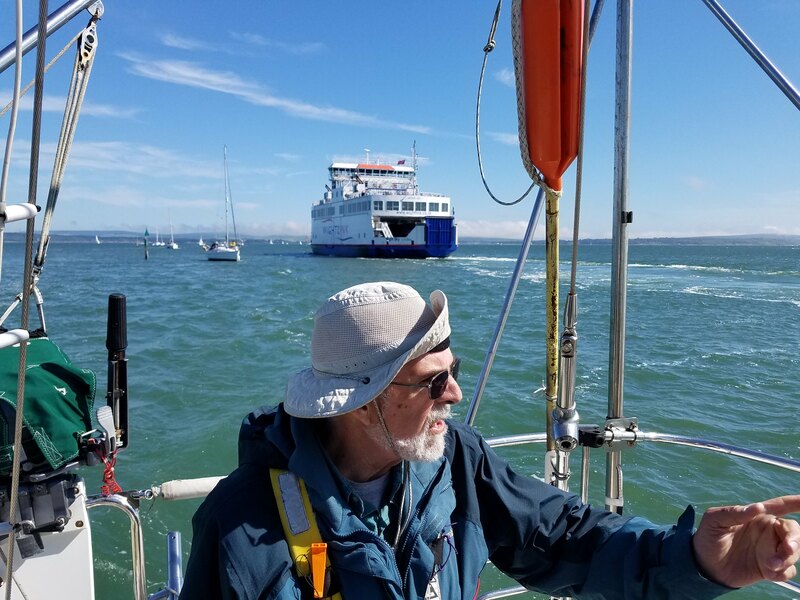 We became closely acquainted with that ferry, because it was departing Lymington as we went in the very narrow channel with a parade of other boats. The chart showed mudflats on either side of the channel, although all were covered at that moment. All you can do is stay as close to your side of the channel as possible, and there is indeed room for us all to get by. We found our designated berth, and managed to get in without hitting anyone. There were all sorts of big motor yachts, overhanging the ends of smaller berths, and plenty of people out on the back decks celebrating the weekend. We became acquainted with the folks on the next boat over, particularly since they very kindly caught our lines as we docked. We shared a drink later, learning about Pimms, an alcoholic concoction with floating strawberries and mint leaves. We walked inland, past a thousand other boats, past "England's oldest open-air seawater bath" (swimming pool to us Americans) and finally into the town proper. Plenty of rich people live here. 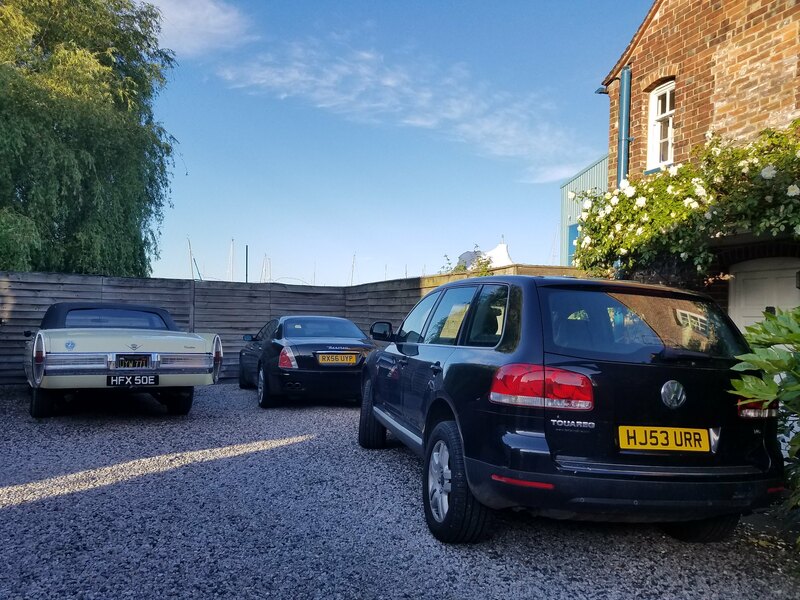 We walked past one yard that had a Maserati and a 50's era Cadillac parked alongside a more mundane VW. The center of the town is charming with narrow streets and tourist-oriented shops. There was a Musto and a Henri Lloyd shop (both sell upscale clothing for sailors). It was Saturday night and all the restaurants were full. We finally found a spot in a bar's terrace and watched the seagulls stealing food off unattended plates. Not surprisingly in this upscale place, the marina rates were the highest we've seen, so we left the next day at noon, timing our departure to catch slack tide at "The Needles", a series of rocks marking the western end of the Isle of Wight and the exit from the Solent. It's a narrow channel and a lot of water must pass through in the changing tides, so timing is important. There is a big castle/fort on the coast with gun emplacements trained in every direction across the water. It's called Hurst Castle and was first built by Henry VIII in 1544. Its military use now ended, it's a place for walkers and sunseekers to wander. There wasn't much wind, so we motored all the way to Portland, 40 plus nautical miles to the west. (I say 40 "plus" because 40 was our distance through the water, but we had 1-3 knots of favorable current most of the way - thus the real distance may have been more like 50 nautical miles.) We chose Portland because we'd had several people say the facilities were very good there, and it looked like an easy entrance in any conditions. The town is actually called Castletown, built to service the marine industry there. South of the town is the Isle of Portland, home to many quarries which provided stone for (among others) St. Paul's Cathedral and the British Museum in London, as well as the UN in New York. The stone was also used 200 years ago to make the immense breakwater which created the largest artificial harbor in Britain. The breakwater is still in fine condition, apparently without much need for maintenance. The marina itself was built for the 2012 Olympics, and the 2012 sailing events were held there. It is indeed provided with very nice facilities! We met Ian and Alison there, and quickly became good friends. Ian was the manager of the Olympic facilities in 2012, and the two of them were the source of a lot of good information about the immediate area and about cruising the south coast in general. They were setting out the next day for Dartmouth, as were we. They planned to leave at about 3 am to catch the slack water around the bottom of the Portland Bill, while we planned to leave at about 1:30 pm to catch the slack at the next tide cycle. I had to look up "bill" because this was not a use I was familiar with. Most of the meanings of bill come from old French, "bille", but there are two which come from the old English word, bill: (1) the beak of a bird, and (2) "a narrow piece of land projecting into the sea: Portland Bill." Interesting that the Oxford English Dictionary uses where we are as their example! We motored the rest of the way to Dartmouth - a cloudy day, and getting darker as we arrived. The entrance to Dartmouth is astonishing. The River Dart cuts a V down between high cliffs, and there is a castle on either side. We later learned that starting about the time of Henry VIII, a chain was at times strung across between the two castles, to prevent the enemies of England from entering. Beyond the narrow entrance the river widens out and there are thousands of boats, on moorings, on anchor and in various marinas. We had reserved a slip at Darthaven Marina, on the east side of the river, at a town called Kingswear. A foot ferry and a car ferry go back and forth to Dartmouth (on the west side) pretty much continuously all day and into the evening. These are old towns, scrabbling up steep hills on both sides of the river, with green fields above and ancient buildings (or ruins) visible on some of the hillcrests. 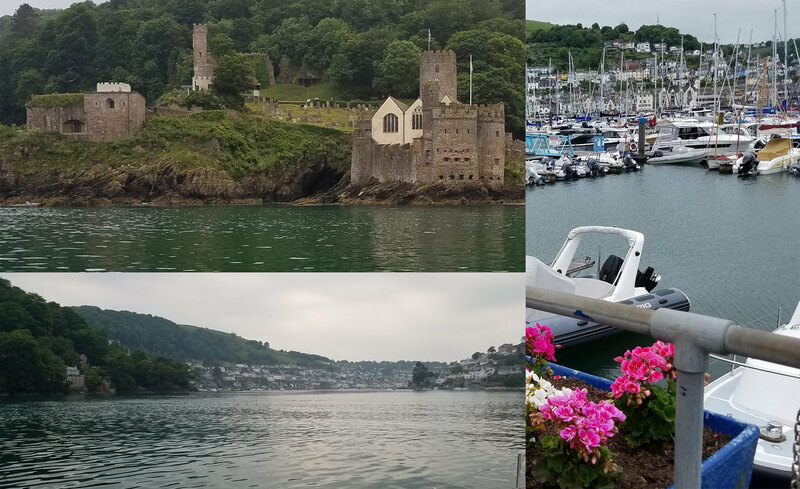 We stayed in Dartmouth three days, with ever more to see and do. 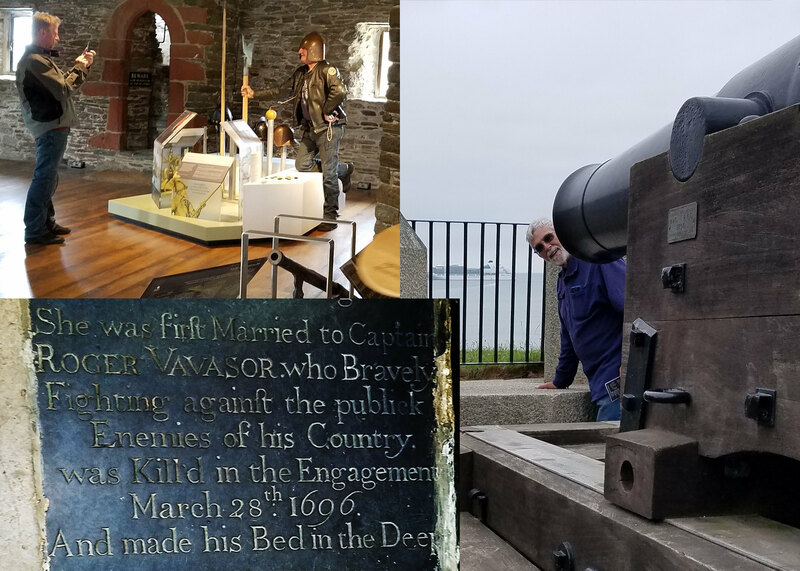 •	We walked out to Dartmouth Castle at the entrance, and learned about the defensive history, including extensive exhibits of cannons and various other weaponry. Some of the cannons seemed to be aimed at a cruise ship anchored offshore. We thought that was fine, since their passengers were clogging the town. Part of the castle is St. Petrox Church, where one of the tombstone/pavers recited the history of a widow who lost her husband in a 1696 naval action against "the publick enemies of his Country" and "made his Bed in the Deep." •	We explored some of Dartmouth, winding up at the Marks & Spencer "food hall" (grocery store), which had some breathtaking prices, but also some foods we've been hankering after, like sourdough bread, strawberries that are red all the way through, and canned soups that actually have some interesting flavors (something that cannot be said of most UK soups). •	A shallow-draft ferry makes a 1 ½ hour trip up the Dart River to Totnes. At Dittersham, Agatha Christie's summer house was pointed out to us, and a bit further on, the Sharpton Estate, founded by an English sea captain who had prize money to invest. Sharpton now is a winery, featuring expensive meals and tours for tourists. Totnes is an interesting town with narrow streets, historic buildings and a museum showcasing Elizabethan life and also featuring hometown boy, Arthur Babbage, a 19th century mathematician who invented (but never built) the first computer. 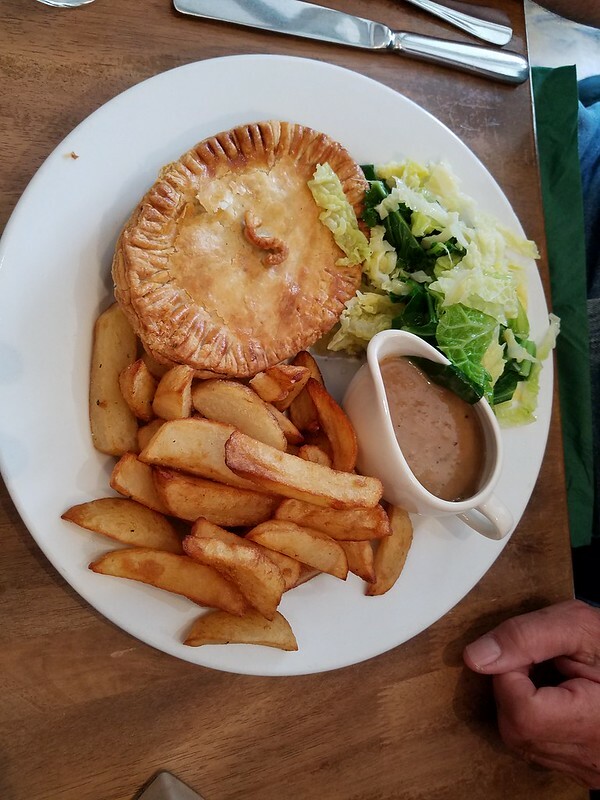 We had lunch at "Pie Street", which features authentic handmade English pies. Craig had the "steak and ale" and I had the "chicken curry". Both delicious. •	Ian and Alison, whom we had first met in Portland, were berthed two docks over at the Darthaven Marina. They found us and invited us over for drinks. We spent another enjoyable hour plus with them, soaked up advice about what to see and do on the south coast, and learned about theretofore unknown English customs (such as, if invited for drinks, you are NOT supposed to bring a bottle of wine, but if you are invited for dinner it's OK...) We very much hope we'll be able to stay in contact and see them again before too long. 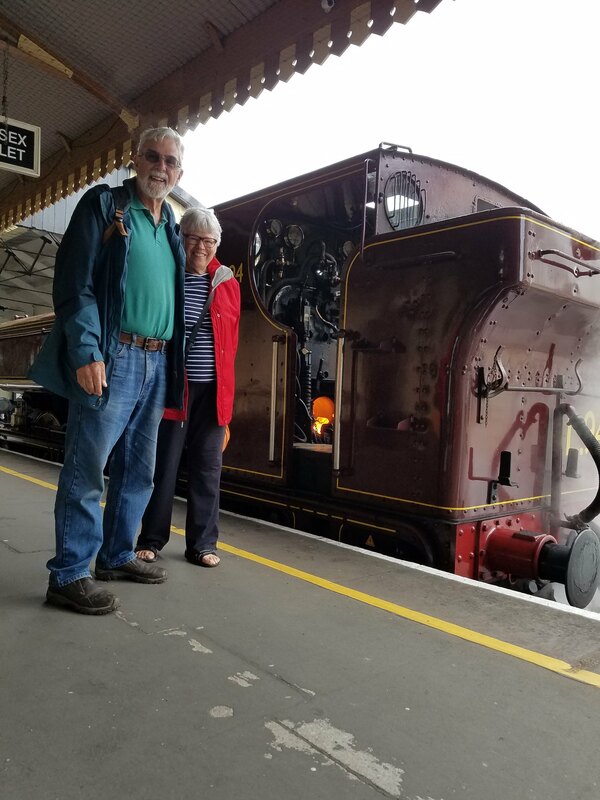 •	We took a bus to Paignton, a somewhat tawdry English seaside resort, and then the historic steam train back to our boat in Kingswear. The steam engine could have been straight out of Harry Potter, with a coal fired boiler, a steam whistle, and that iconic "Chug-ch-ch-ch, Chug-ch-ch-ch" which speeds up as it leaves the station. Above: In front of the steam engine - Notice the view of coal burning! •	We had lunch at "The Ship Inn," a traditional English pub located on "Higher Street" (just above "High Street"). 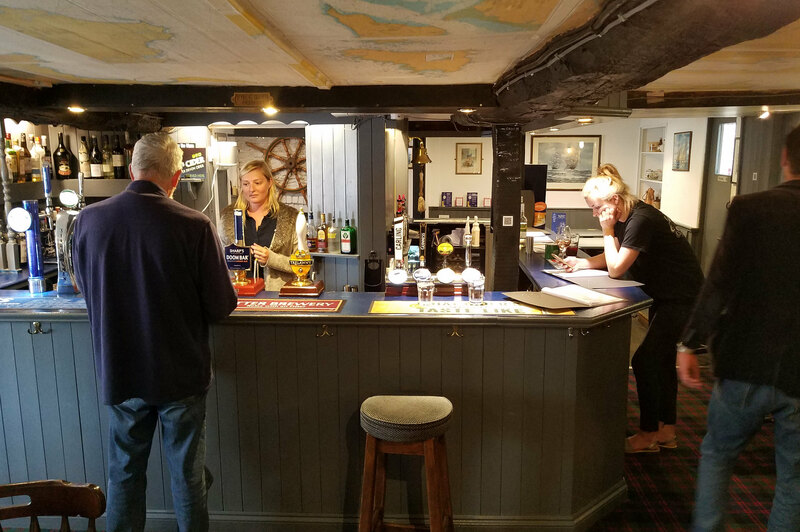 The staff couldn't say how old the pub was ("very old"), but it had a low ceiling with rough, black-painted beams, and the ceiling itself was papered with old navigation charts. We'll be here for 7 days total, with several major boat chores to undertake. We think we'll rent a car and go see some of the more land-based sights in Devon and Cornwall. We hope all is well with you, our dear friends and family. Check out our Flickr album which has lots more pictures corresponding to this post.